You will probably want to leave your pack, or most of its contents, in town while you do this bit. I’d also recommend tacking on the 45 mins walk to the Cable Car at the end in order to shave a bit off the walk to Porirua the next day, as this is quite a long walk, with steep uphill bits. You could begin by riding the Cable Car on that day to a start point of its upper terminus (runs every 10 mins from 7am weekdays, 8.30am weekends, $4.00 one-way). Or even walk through to Ngaio station (2 hrs 45 from Civic Square), take the train back to Wellington ($5), and restart there the next day, so potentially allowing for different start and end points on following days, or simply shortening the day to Porirua. Take a number 1 bus (Island Bay) to get to the beginning of the trail. The buses go every 12 minutes or so from the Wellington Railway Station on weekdays, starting at 6.30am. (They go a bit less often on weekends, starting 7.05am Saturday and 7.30am Sunday – see the Metlink timetable). They travel through the centre of the city to Courtenay Place and then head south through Newtown. The journey takes 20 to 30 minutes. Get off at the very last stop, when the bus turns left after the long run down to Island Bay. Opposite is a children’s play area. Head through that towards the sea and at the right hand end is a rock marking the beginning of the trail. Finding the rock is really the only hard part of the route through to the Civic Centre, as it is marked all the way to Oriental Bay with bright pink Southern Walkway markers. If anything, there are too many markers, spoiling the landscape. To begin, cross the road to the beach side, and head east, around the foreshore to Houghton Bay. Turn left up Houghton Bay Rd, and turn left off that when you come to a gravel car park and a playing field. 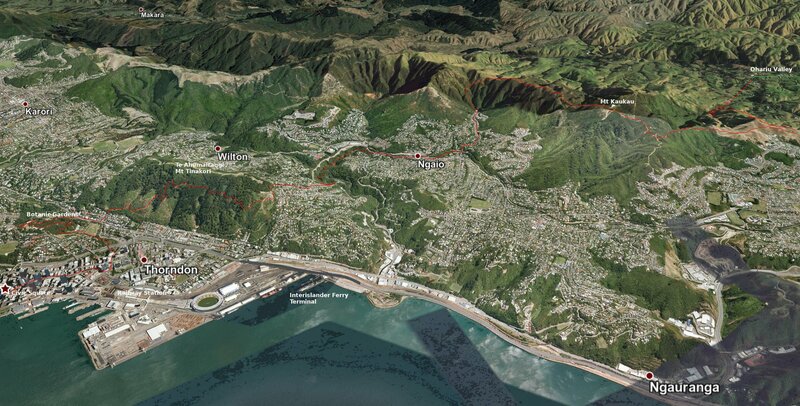 The route then goes up to Mt Albert, site of some radio transmission towers you can see from well below. From here a path skirts the western side of the ridge until you get to the top of the baboon enclosure at the Wellington Zoo. Turn right and you reach Melrose Park. A little bit of road walking takes you to the top of Manchester Street, where you cross over into the driveway of Truby King House and Gardens. (Truby King was a famous health reformer and founded the Plunket Society in 1907 to promote infant care.) You exit the Town Belt at a zig-zag into Coromandel St. Go along this to Constalbe St, a main road, cross at the pedestrian crossing here and turn right to go uphill and then left into Alexander Rd at the crest of the hill. You now wend your way alongside Alexander Rd road up towards Mt Victoria. Down off to the left are sites where half a dozen scenes from the Lord of the Rings films were shot (notably where the Narzgul rode, hunting for the hobbits in the ‘get off the road’ scene, co-ordinates -41.294575, 174.791781 (S41º18.075′, E174º47.319′) – note that the tree base they hid under was a studio construction, so you won’t find it); and an old quarry at the top of Ellice St for the Rohirrim camp at Dunharrow ). The Southern Walkway doesn’t go to the summit, with its classic postcard view of Wellington, but it is worth the quick diversion to pop up and have a look. The pink markers run out towards the point where the track joins Palliser Road, but there are older Southern Walkway markers. After crossing the road the track continues on along the side of the hill, crossing over a couple of footpaths down to Oriental Bay, and eventually going down to the bay itself at the base of Carlton Gore Rd. Once on the bay, walk along the promenade back to the city. There are toilets opposite the main, sandy beach, as well as others beside the small beach following. After the Freyberg Pool you can hop down some steps to the water’s edge and walk along in front of the boatsheds for a more pleasant stroll than on the main footpath. Turn right to stay on the waterfront when the main road goes left, and pass by the huge mass of the beige coloured Te Papa museum. Don’t go hard right now, along the wharf, but steer a course past the Circa Theatre building and between the large concrete building at left with LED displays of sharemarket prices and the Wharewaka on the right, with its faceted black roof. Go up the steps onto the road overbridge, with its roughly carved wooden sculptures, and down into the Civic Square, with the public library before you and the City Gallery Wellington on the right. There is a TA plaque set into the orange bricks on the ground just as you come down the stairs into the Square. YHA Wellington – 292 Wakefield Street, close to supermarket, buses, waterfront, Te Papa. By all accounts one of the best hostels around. 04 801 7280. Cambridge Hotel and Backpackers – 28 Cambridge Tce, an 1883 hotel, not far from Base Wellington, 0800 375 021 freephone. Base Wellington – 23 Cambridge Tce, not far from YHA, 0800 2273 69, 04 801 5666. Wild Zebra Backpackers – 58 Tory St, just off Courtenay Place, 0508 00 5858 freephone, 04 381 3899. Nomads Capital Backpackers – 118-120 Wakefield St, very central, top-rating hostel, 0508 666 237 freephone, 04 978 7800. The Setup on Dixon – 15 Dixon St, very central, 04 830 0991. Lane Way Backpackers – 107 Manners St, down Opera House Lane, central and close to The Setup on Dixon hostel, 04 830 0095. Trek Global – 9 O’Reily Ave, behind St Mary’s Church, Boulcott St, very central, 0800 86 8735 freephone, 04 471 3480. Worldwide Backpackers (BBH) – 291 The Terrace, a hike uphill to get to it, 04 802 5590. Rosemere Backpackers – 6 Macdonald Cres, in a huge old house, not far from Worldwide Backpackers, uphill, 04 384 3041. Hotel Waterloo & Backpackers – 1 Bunny St, across from railway station and supermarket and near buses, 0800 225 725, 04 473 8482. The Dwellington – 8 Halswell St, Thorndon, not in the centre of the city but close to a supermarket and not far from the railway station and buses, in an old home, 04 550 9373. Beethoven House – 89 Brougham St, Mt Victoria, a bit of a walk from the city centre, 04 478 8855.
i-SITE Visitor Centre – Wakefield St, temporarily opposite bottom of Cuba St, 04 802 4860. Department of Conservation Visitor Centre – 18 Manners St, 04 384 7770. You might want to think about the location of supermarkets on your route north in terms of when to load up and where you are staying. There is a smallish New World on Willis St, and another similar size Countdown on Lambton Quay, but the main inner city New World is near Te Papa, between Wakefield and Chaffers St, opposite the Youth Hostel. Then three large ones in Porirua, but you won’t reach these until after leaving Elsdon Camp. There is a New World at Mana and grocery stores/dairies at Plimerton, Paekakariki, Raumati and Paraparaumu Beach, and two decent sized supermarkets at Waikanae, but well after the El Rancho camp, if you are staying there. Exit Civic Square at its western entrance into Mercer St (with tramping stores Dwights and Bivouac on the left and Kathmandu outlet store on the right). Turn right into Willis St and you will find more such stores further down: Macpac on the left and Kathmandu on the right. The next corner is with Lambton Quay, where you turn left into Wellington’s most upmarket street (including a TA plaque in the pavement about halfway down, outside McDonalds). At the far end of Lambton Quay is a left turn into Bowen St, the beginning of your hike up to the top of the Cable Car. On a fine day, a more pleasant alternative to going through Civic Square and the centre of town from Oriental Bay would be simply to continue around the waterfront from Te Papa until you are opposite Whitmore St. This is a wide street that offers drive-on access onto the wharf and a viewshaft down to the Beehive (NZ’s seat of government) and beyond to the tree-covered slopes of Te Ahumairangi/Tinakori Hill. Head down Whitmore and cross to its left side to reach the Lambton Quay/Bowen St corner. Walk up the left side of Bowen St, cross The Terrace, and go up the steps to the large, white, rounded Ministry of Education building in front of you. Go around the right hand side and you will find yourself in Bolton St Cemetery. Straight ahead, above the tombstones, is a curved ramp leading to a bridge over the motorway. Take the bridge to the other side of the cemetery (cut in two by the development of the motorway) and follow the City to Sea Walkway signs. These can be a bit faded, but they are generally obvious and sometimes have the TA sign as well as you make your way past a playing field, the rose garden and a café all on the left and into a network of paths snaking up the hill. If you lose the signs, just keep heading uphill until you get to the red brick Carter Observatory. A little further south-east is the top of the Cable Car. Walk down to the main gates of the Botanical Gardens, by going a little more south than the way you came up. There is a rock with a large TA plaque on the start of the path. It goes down to the top of the children’s playground, passes the Tree House, and then the Sound Shell. The path is inset at intervals with a glass mosaic that apparently represents a flowering pohutukawa branch, with three green leaves and a spray of orange and red for the flower. Cross Glenmore St outside the gates and head north and then take a left turn up St Mary’s St when you get to the dairy with the glassed-in verandah above it. The Northern Walkway sign is at the top of this steep street. You follow this path up and around the side of the hill popularly known as Tinakori Hill, but more properly as Te Ahumairangi Hill (Tinakori is already a mis-spelling of Tina-kahore). Continue until you hit Weld St, go down it, crossing Wade, then across Margaret/Cecil St, and down its steps into Wadestown Rd. There are toilets and a pedestrian crossing at right. Cross over, turn left and after about 50m turn right into right into Hanover St, and at the end of this there is a display board showing the tracks for the next part of the Northern Walkway. The track entrance is easy to miss – it is just behind the signboard. As on Te Ahumairangi Hill, there are tracks all over the place, and you depart from the Northern Walkway to follow TA ones for a while. The TA route is along the stream, though after a short section beside the stream you have to go up hill and then along the hill-side before coming down again. There are TA signs to guide you.. You eventually rejoin the walkway and end up on Waikowhai St. Walk north along this, through a roundabout where it becomes Ottawa Rd, and just after this point is the red brick Ngaio Town Hall and Library, with the last toilets on the rest of the route, unless the café is open in Ohariu Rd. Go behind the library into Cummings Park. Stay above the children’s play area to take a track through to Awarua St. At the very end of this long street uphill is Bells Track. This brings you up onto the ridge line. Then you go north to reach the summit of Mt Kaukau (445m). This is the high point with the huge transmitter tower on it that you would have seen from various points earlier. There are great views all along here, but it can also be very windy, and sometimes you may be in cloud. If you want to bail out, you can take the track downhill to the east from the lookout to Woodmancoate St and catch a train back to Wellington, or further on, leave where the Old Coach Rd starts and descend into Johnsonville, head east, and again, catch a train. Continue north and then down off the ridge to the left on the Old Coach Road, until it joins the end of Rifle Range Rd. It is all well signposted. Continue straight through an intersection. There is an award-winning café called the Saddleback just through the intersection (open weekends only). Continue for about 5 km of road walking along Ohariu Valley Rd. Then at right you will see a large sign marking Spicers Forest, a car park, and a wide sealed road behind a gate going up hill. Head up this road, and after some distance a small post marks the turn-off for TA walkers to the left. Note that despite the TA sign at the Spicers Forest turn-off, the map shows an alternative route at the head of Ohariu Valley Rd. That should be fine too. In either case you will be in pine forest on what seems to be a mountain bike trail. It is marked with yellow/green circles on the trees. You come out to walk along a fence line and cross a stile. On the other side is a large sign claiming 2–3 hours to Elsdon Camp. It is more like an hour. The route up to Colonial Knob (468m) is marked with blue painted poles. Again, it may be very windy on the top, but there are really great views, extending from Wellington Airport in the south to Waikanae in the north, and off towards Australia in the west (no, you can’t see it!) If the weather looks like it is going to be really unpleasant on the top you can take the track for Raiha Rd from near the stile. Or earlier, don’t take the left turn of the Spicer Forest Rd, and continue along the forest road into Broken Hill Rd, past the landfill and again eventually reach Raiha Rd. From here it is down the other, northern, end to come out by Camp Elsdon on Rahia St. You will probably want to stop here, as it is the only cheap place in Porirua. But note that it is another 40 mins or so to the supermarkets. Turn right (south) along Raiha St and after about 200m (beyond the intersection with Makaro St), immediately past number 41A and next to the 70 kph signs, turn left up the bank into the Raiha Walkway. This passes to the north side of a long line of pine trees. When it ends turn left a bit along a driveway (Heriot Dr) that serves Te Wananga Aotearoa, a modern building with a tall carved pou (Maori pole) outside it. Turn right into Hagley St and across the roundabout and busy Titahi Bay Rd. The railway station is in precisely the direction you are traveling (east), but there is a shopping mall and a jumble of buildings in the way. It the North City mall is open, it is quickest to enter that, get to the ground floor and keep going east, making sure to avoid the left branch when it divides near the end. You will now find the New World supermarket at your left when you exit and Station Road beyond that. Alternatively, go round the damn mall by walking right along Titahi Bay Rd. Camp Elsdon – 18 Raiha St, Elsdon, Porirua, 04 237 8987, camp_elsdon@xtra.co.nz. This is oriented towards groups but casual visitors are also welcome. The cabins are cheap ($25/person), and there is a lodge that you can stay in if it isn’t full with a group ($25/bed, sleeping bag required). Tent sites also, $12 per person. There are three large supermarkets in Porirua. New World is about 150m north of the station, Countdown 200m further north again, and Pak N Save 200m more again. Porirua Station to Plimmerton Station 1 hr 45; Plimmerton Station to Pukerua Bay Station 1 hr 20; Pukerua Bay Station to Paekakariki Station 3–3.5 hrs. Beginning at the Porirua train station at Station Rd, walk north along the western side of the waterway and then turn right onto the road overbridge that crosses both the motorway and the rail line. Over the bridge, continue north on the side of the highway for about 500m until a pathway leads off the right. This links into Okowai Rd towards an area of pine trees. Enter the pine plantation via the driveway to the Adrenalin Forest high-wire confidence course and continue on the sealed road as it circles around and goes uphill to the Italianate Gear Homestead built in 1887 by meat magnate James Gear. (It has a café open over summer Sunday to Friday, and toilets in a separate building at the top of the grounds.) Walk along the driveway and out of the homestead grounds back onto Okowai Rd, opposite Aotea College. Continue north along the road, then left into Whitford Brown Ave and over the pedestrian crossing to Aotea Lagoon (more toilets here). Traverse the children’s playground at the north end onto Papakowhai Rd. About 800m north on this road take the pink pedestrian overbridge to Paremata Station and then the underpass off the platform to bring you back onto the right hand side of the tracks. Continue through the car park and onto the footpath that takes you across the road bridge over the estuary at Paremata. At the end of the bridge go down the wooden walkway to the left and under the railway bridge. Continue north again, with the railway line on your right and Ngati Toa Domain further along on the left. If you need to visit a supermarket you can cross the railway line at Mana Station and pop into the New World supermarket just north of it. Otherwise, stay on the path until it goes around the foreshore and reaches Steyne Ave at the point where the street crosses the railway. Turn slightly left into Steyne Ave. Just before the shops and cafés, at the north end of the Plimmerton railway platform, is a sign for the Ara Harakeke Pathway (which you have been on since Paremata Station). Moana Lodge Backpackers BBH – 49 Moana Road, Plimmerton, 04 233 2010. Twenty or so metres north of the Pukerua Bay shop are some toilets with a large Te Araroa panel showing the route along the Escarpment Walkway from here. Top up on water as there is none that’s drinkable on the track. To get onto the track, continue north a few minutes to cross the pedestrian overbridge, take the right hand path to backtrack parallel to the motorway on the other side, and turn left to the Pukerua Bay Station. Take the underpass beneath the railway to the station car park and turn left. From here TA signage is clear and frequent through to Paekakariki. If you plan to do the Escarpment section as a section walk and are coming from Wellington, then check out the Day Rover train ticket. This should be cheaper than two one-way tickets. And if you are arriving by car it may be best to park at the station rather than the Pukerua Bay shop (which has limited parking) – or better yet, park at Paekakariki and take the train back to start walking so your car is ready and waiting when you finish. The track along the hillside is narrow and exposed to sun and wind, and at times goes far above the highway that wends around the coast. The official track notes warn people who suffer from vertigo not to attempt it, but if you have traversed the peaks and saddles of the South Island TA trail then you will not be worried. Even if you stumble and fall you won’t go down too far here. There are two swing bridges, but they are wide and well secured from swaying. The views out over to the South Island in the south-west and Kapiti Island in the north-west are stunning. There is a certain amount of climbing up wooden stairways and, towards the end, a long descent to a section that runs close to the rail line. This finishes by ducking under the road overpass to cross to the west of the highway as you approach Paekakariki. The November 2018 map shows the route going south a little once you are over the road to Ames Rd, which brings you north to the Paekakariki village (turn right at its end into the village, or left into Beach St to continue to the next section). However, a new pathway that runs through the trees parallel to the main highway is now constructed a little way north of the bridge, so it is more direct to take this. At its end, cross the railway line into Beach St and through the village to the sea. Paekakariki Holiday Park – 180 Wellington Rd, behind the surf club (20 mins from shops), 04 292-8292. Cabins (cheapest $70 for 2), tent sites ($12/person), and a 30-person lodge with bunk rooms. Not bookable online. Would pay to check that the lodge isn’t just for groups. Aribnb.com and bookabach.co.nz have other places to stay in the settlement and could be worth checking. The former starts with a caravan at $35, plus other places at $47 and $50 (plus AirBnB fee). Paekakariki village has a dairy/grocery store, a couple of cafés, two fruit and vegetable shops and a pub. The church on the corner has a tap on its eastern side where you could fill up on (holy?) water. From Paekakariki village, head down Beach St to the beach, and turn right and walk for about 20 mins north, passing the community hall and sports club to reach the surf club. There are toilets here. (In fact there is no shortage of toilets all the way along the section. Nor of cafés.) Go past the surf club then find the wooden footbridge bridge over the stream. You will come to the McKays Crossing Track sign. That’s what you want. It is a dirt track through coastal dunelands. If the tide is not too far in you could walk on the beach, but there is plenty of beach walking coming up. The track ends at Whareroa Rd. Turn left towards the beach on this road to the picnic area and then right along a sealed road to a car park. Here is a sign reading ‘Coastal Track to Raumati’, and a TA marker. As at October 2018 this track is damaged due to coastal erosion, but you can probably still use it, or you can either walk on the beach or use the Inland Track. At the end of the Coastal Track you join suburban roads, and here you can turn left onto the beach, or go a bit further to Jeep Rd and turn left to the beach there. If the tide is high it may not be possible to walk on the beach, so you will either have to use the rough, and at times sandy, platform above the beach, or use the roads that parallel the beach amongst the houses. You will pass Raumati Beach village, which has quite a nice and well shaded picnic and children’s play area close to the beach, with an abundance of cafés and restaurants, a small Four Square, a dairy, and take-away outlets further back. There is a bridge over the stream. Continue on the beach and the next settlement is the larger Paraparaumu Beach, with a picnic area next to the beach, and again further back more cafés, shops, and a small supermarket. There is some accommodation here (see below). You leave the beach at Waikanae River estuary, which is preceded by two large yellow marine reserve marker triangles. Behind these is a track. If you can’t find it, it is just as easy to go around into the estuary and meet up with the road adjacent. A little way along the road opposite Hadfield Place is an interpretive display about the estuary. Take the track marked ‘Waikanae Estuary Walkway’ that leads from the display. It eventually starts going up-river. When you reach Otaihanga Domain cross to the north bank of the river on the large wooden footbridge and continue up river on this side. There is a small wooden bridge to the right further up. Go over this. You will still be on the north river bank, and go under the huge concrete expressway bridge and eventually reach the SH1 bridge over the river. Turn left at the bridge on the downstream side and a few hundred metres along the side of the road to the north are the Waikanae shops. They include large Countdown and New World supermarkets. There are no backpackers in Waikanae and the only campground is El Rancho, some distance before the shops. Ken Fraser is a trail angel located 100m from the beach on the northern edge of Queen Elizabeth Park, and offers camping, toilet and showers. 04 905 3714. BBH backpackers – Paraparaumu Beach (aka Barnacles Seaside Inn) 04 902 5856. Kapiti Holiday Resort – 16 Beach Haven Pl, north of Paraparaumu Beach, 04 233 1965 (aka Prestige Caravans). Marie Bismarck – trail angel who offers showers and camping at Paraparaumu Beach (mariebismarck@gmail.com). El Rancho Holiday Park – 58 Weggery Drive, Waikanae Beach, 04 902 6287. You would have seen a sign for this on your way up the river, so don’t go all the way to Waikanae if you want to stay there. It is a Christian camp, but has campsites and motel-type units and cabins (seem to be $70/night) available for anyone. No alcohol. River Pa – 20 Reikorangi Rd, near Waikanae. Self catering, hot shower, indoor mattress, $10 koha. 022 053 3618. The section through the Tararua Ranges that begins at the Pukeatua Track and goes through to Scotts Rd in the Manawatu section can be challenging tramping. The Tararuas are notorious for mud, tracks broken by tree roots, fallen trees, numerous stream crossings, and wet, misty, windy weather. You can see from the km vs hours indicated that progress can be a slow 1.2km/hr in sections. There are great views on good days from the high, open ridges, but on bad days these can be dangerous places. Statistics show that the ridge tops are in cloud 78% of the days in a year: people do get lost and some have died from exposure. And 5,000mm of rain per year falls on the western side of the range (where you are going, with much of this in summer). By comparison, NZ’s notoriously wet Milford Sound, gets only a tad more at 6,400mm. So get a weather forecast before you start! And consider a bit of extra food in case you get stuck in a hut waiting out the weather (or worse, lost). This is 10 km road walking on sealed roads followed by a tramping track that includes an ascent of Pukeatua (812m). From Waikane village head south 150m from the railway station to Elizabeth St that crosses the railway line and heads east. It is the only road doing so from Waikanae. This becomes Reikorangi Rd after 1.5 km and roughly follows the Waikanae River. At all the following junctions take the left hand road: At Reikorangi the road branches left to Ngatiawa Rd by a church. Take Ngatiawa Rd for a short distance. About 300m after the Reikorangi Potteries Park and Cafe (open Tuesday to Sunday) turn left into Mangaone South Rd (there is a shelter on the corner). Stay left when the road branches 5 km further on to reach the car park (no toilets) 2hrs walking from Waikanae at the beginning of the tramping track . You want the Pukeatua Track at right, not the Mangaone Walkway. They are clearly marked. There is a gravel road and a gate and then a 4WD track through pine forest marked with blue markers. The area adjacent to this is private land and you need to stay on the track. There is a small stream crossing a short way in from the carpark, and then no water source until the end of this section. The track heads steeply up a ridge to Pukeatua and then down the other side along the ridge to another river valley, formed by the Waiotauru River. It is about 3 hrs 15 up and 2 hrs down. You encounter the Fenceline Loop Track near the bottom. Turn right into this for the quickest way down, then left, to reach one of the Otaki Forks campsites, with a toilet and water from a tap. There is an information board here showing all the places where camping is permitted (which is just about everywhere except the picnic area past the warden’s house). It is about 2 km further down the road to Parawai Lodge, just above the actual forks themselves, where the Otaki River meets the Waiotauru River. You go through the picnic area and across the swing bridge to reach it. Even if you don’t stay in the lodge (it is an older, basic tramping hut), the best camping spots are near it, and you can access the river more easily than the designated camping areas along the road. There is a DoC warden near the lodge. If you want to exit the track at this point it is 10km down the road to Otaki, but the road is narrow and winding, and not very safe for walking. Missy Sinai – Near south end of Mangaone South track has a shower and a place to rest up, 027 655 7012. Ruth Carter – also offers camping by the DoC carpark at the end of Mangaone South Rd. theoldmill@gmail.com. For the closest self-catering rural cottage accommodation, and pickup/drop-off from Otaki Forks, call 06 364 3220 or 0274 426968, pipsteele@xtra.co.nz. Beni Paroli (AT hiker) – 06 364 6261, pepperonis@xtra.co.nz for pickup, shower, meal and accommodation, Otaki Beach. Bridge Lodge Backpackers – 3 Otaki Forks Rd, near Otaki, 06 364 6667 (camping available also). Local taxi service – Wally (retired), 06 362 6319. Paraparaumu Taxis 04 296 1111; Kapiti Coast Shuttles 04 298 3335. Cross a swing bridge over the Otaki River. A hike up a hillside then detours to skirt a slip, and develops into a well graded track along an old tram track. Unfortunately, this is interrupted by another slip detour that climbs around spurs high above the river for a considerable distance. It is marked by a large orange triangle heading up to the right. The track is extremely rough and difficult going, consisting of much up and down, tree roots, fallen trees and mud. You could always investigate whether it is possible to get round the slip, because its location is not too far along the old track and this would save you an hour and much tiresome effort. Note that both the old track now affected by the slip and the new detour are shown on the NZ Topo map, but only the old route on the official TA map and on the downloadable map on the New Zealand Topo Maps app. As far as DoC are concerned, the proper route is the detour, so it is surprising that this situation is not covered in the official TA notes or map (as of Dec 2017). Once you get near the hut a signpost marks a shorter, dry weather route down the Arapito Creek to the Otaki River. This is given as 20 mins, vs 30 for the alternative route marked on the TA map which skirts up around the river and is in fact about 40 mins and involves a fair bit of climbing. You will probably have to wade the Otaki River on the shorter route though, and it may or may not be clear where to climb up by a small creek to walk along the banks to the hut (the spot opposite the hut would require you to swim). Waitewaewae Hut is a pleasant one and, as noted, has swimming below. Continue along the river bank and cross the Otaki River via the swing bridge. You are now in for a killer of a climb, gaining some 1000m in 3 km. Eventually you reach Junction Knob where you turn left for Mt Crawford (1462m). You could always go right and walk the hour to Anderson Memorial Hut along the ridge if you want to spend more time on the tops, or the weather is bad (Nichols Hut is 90 mins away) or you believe Nichols Hut will be full. But you will need to retrace your steps the next day. Anyway, it is otherwise a descent and then climb to the Nichols peak and down to its shoulder. The hut is 10 mins down off to the right here. It is small and a very cramped space for eight people to share, should it be at capacity. If you end up stuck here in bad weather for a day or more with seven others you will have an experience to remember! The weather is always something to be carefully considered before going onto the tops of the Tararuas. In strong wind or rain it may be better to wait for clearer weather at Waitewaewae, as once you are out of the bush and along the high ridges it is very exposed. The nearly 12 hrs it may take you from Otaki Forks to Nichols means you will be very tired by the time you are on the ridge tops, and being repeatedly blown over up there by gale force winds will only push your exhaustion to the limit. The next bit is along a ridge line, mostly through stunted bush but with open areas amongst tussock and small shrubs at the Kelleher and Puketoro peaks (both unmarked). Tiny Dracophyllum Hut is bright orange and in amongst the trees. The hut is named after the shrub/tree that often looks like something out of a Dr Seuss book, with a clump of slender leaves at the end of a long branch. You could potentially put up a couple of tents here if you need to stay and the hut is full, but there is not a lot of room. More ridge walking through bush, via Butcher Knob, ending with a strenuous climb up the clear tops of Pukematawai (1432m). Then you turn north-west down the Northern Crossing Track over open tops to a fork. Keep left and it is less than a kilometre through bush to Te Matawai Hut. You now go along the Dora Track, on Dora Ridge, passing Yeates Track on your right to arrive at Richards Knob where a track branches off to Gable End. The route from 2018/19 takes this Gable End Ridge track. This saves the difficult Dora Ridge section, with many blown over bushes, mud, and climbing but you miss some good views and it took you past Waiopehu Hut, which is more modern and rather nicer than Te Matawai. 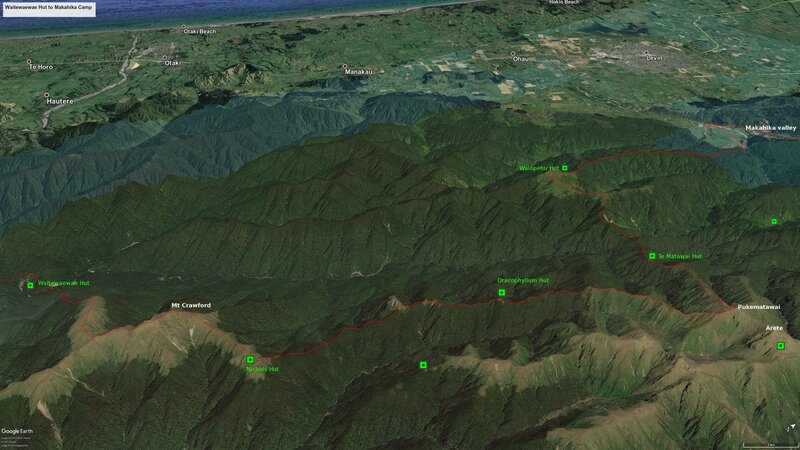 This route via Waiopehu Hut takes 6 hrs 45 from Te Matawai to Poads Rd and is 15km. So you save a bit of time with the new route, but a more radical shortcut again would be to take the right track and the fork mentioned above just before Te Matawai Hut down to Mangahao Flats Hut and the Mangahao River, with its No. 1 and 2 reservoirs. That will mean a longer day if you are coming from Nichols Hut, but you could stay at Te Matawhai and back track a bit the next day. There will also be a fair bit of road walking down here (although compare that against the road walking of Poads and Gladstone roads), and you may be able to cut across before the second reservoir to join up with the Makahika–Mangahao Track. This may involve bush bashing, as there is no track. And finally, you will potentially miss out on the pleasures of Makahika Camp. It is 800m downhill from here and easy, fast hiking. Take the left track at the fork at the end of the ridge. The track emerges from the bush into farmland, where the trail is indicated by blue markers. You then enter Poads Rd, which joins Gladstone Rd at a large one-way bridge after 1 km. Turn right and go north-east to Makahika Camp (3.5 km), past the wooden Greek Orthodox church. Or keep on the same direction south-west to go to Levin (8 km). Paradiseonahillside AirBnB ($30) – about 2 km from Poads Rd heading towards Makahika Camp. No signage. Ohau River Cottage – 292 Gladstone Rd, Levin, 06 368 7651. Levin Holiday Park – 38 Parker Ave, 06 368 3549.